In addition to listening to your favorite music, you can now use Spotify for watching your favorite podcasts and videos and jogging. This move by the service will put it in direct competition with lots of technology outlets, which also include some heavy duty names such as YouTube and Apple. The world of subscription streaming music services is currently dominated by Spotify and it has announced a number of changes that it will be making to its mobile app that will enable it to move into new realms of media distribution. This is just before the expected arrival of a competing music streaming service from Apple Inc.
Short video clips, podcasts and also playlists are part of the new features that will be added to Spotify. The playlists anticipate the kind of media and music a user may be interested in depending on the time of the day. Various media outlets will provide the content such as NBC, the BBC, Nerdist, Maker Studios and Comedy Central. 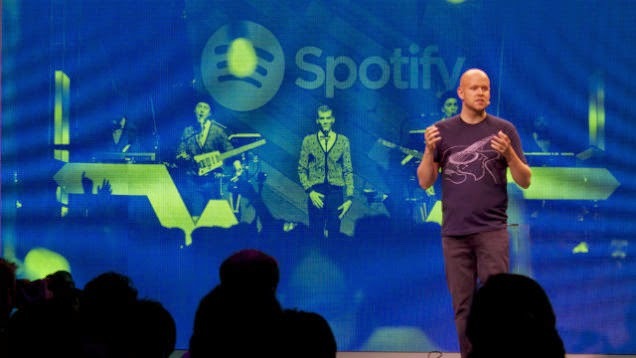 The chief executive of the company, Daniel Ek, spoke at a news conference held in Manhattan where he said that the perfect music should only be a tap away. There is also another feature that can match the tempo of the music in a workout playlist according to a runner’s pace, as registered by the device. Another indication of how closely Spotify is competing with Apple is the announcement of its partnership with Nike, which has had a close association with Apple and iTunes this year. There was also some celebrity power at the event. Abbi Jacobson and Ilana Glazer, the stars and creators of the Comedy Central show ‘Broad City’, made jokes about serving like video distractions on their smartphones and D’Angelo, the singer also played with a band including the bassist Pino Palladino and Roots drummer Questlove. Last year, Apple purchased Beats for $3 million, the streaming service and headphone company, but hasn’t mentioned any plans. However, the music industry has already geared up for a colossal fight. Spotify has a head-start in the United States as it has been established for four years and has a total of 45 million free users and a total of 15 million paid users. In the last two years, the sales of downloads have plunged, but Apple has been slow in moving into the streaming market. Nonetheless, the vast reach of the company has made it a significant threat to others. The new direction taken by Spotify has put it in direct competition with other media and technology companies. The disappearing-message app Snapchat also offers audio clips and short-form videos from a number of the same partners as do Yahoo and Google’s video arm, YouTube. In addition, thousands of high-definition videos are offered by another music streaming service called Tidal, which was purchased by Jay Z for $56 million. Also, this week, another music streaming service called Deezer introduced a total of 20,000 podcasts. Music services have begun to emphasize the value of playlists in order to distinguish themselves.